Las Cruces, NM – July 28, 2016 – This past spring, International Boarding and Pet Services Association (IBPSA), in conjunction with business consultant, Crystal Canine, commissioned an online financial survey of 109 pet care service business owners based on their 2015 financials. Compared to the prior year’s survey, the results indicate that the pet care services industry – primarily pet boarding facilities – is beginning to feel the effects of increased competition thanks to the multi-billion dollar industry lure and growing popularity of online pet sitter listing services. While the bar to enter the pet care services industry remains low, the bar for long-term sustainability is rising thanks to the increased competition. Despite this, survey data reveals that many in the industry may not be maximizing their revenue opportunities. Dog boarding continued to be the most significant proportion of annual revenue for most of those surveyed, averaging 40% of revenue in 2015, down from 44% for 2014. Payroll costs for the surveyed businesses, clustered around half (50%) of revenue. The takeaway? Make sure you’re maximizing one of your biggest expenses by investing in staff training and certification, allowing you to raise rates to reflect an expert level of care and service. The median occupancy for dog boarding (enclosures) was 60% and 48% for dog daycare, while grooming schedules showed higher utilization at 73%. The takeaway? While you may enjoy 100% during the summer and holidays, pet care facilities may be at only 20% in off-peak times. Consider complementary revenue streams (grooming, training, pet massage) to help with consistent cash flow. Independent businesses remain the most prolific business model for pet care services with 93% of survey respondents owning only a single location. The median compensation of a business owner was $57,000, down significantly from a median of $72,000 in 2014. While the highest compensation reported was $275,000, on the other extreme 8% of business owners took out no compensation at all. 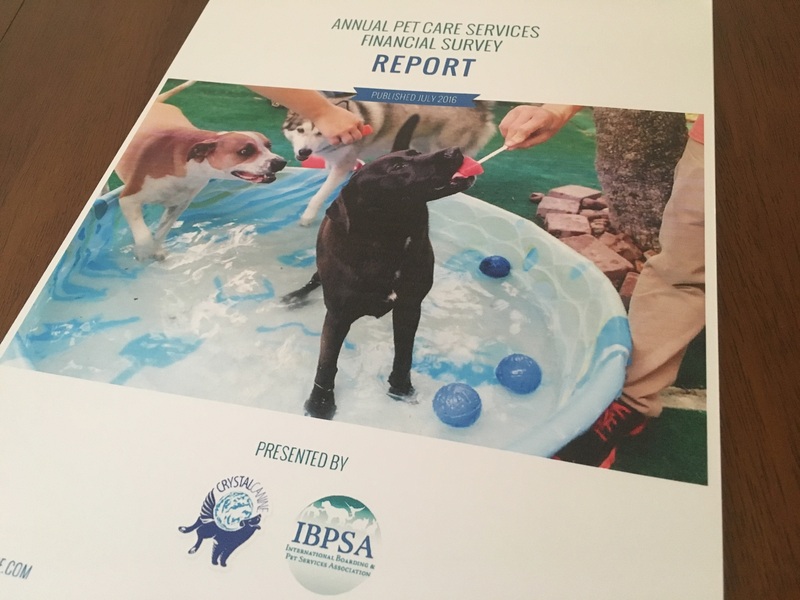 The complete, 90 plus-page Annual Pet Care Services Financial Survey Report (published July 2016) is available for purchase from IBPSA. The report provides crucial, insightful information to assist pet care services business owners with planning and budgeting including pricing, discount, and payroll guidance. Purchase details may be found at www.ibpsa.com/survey-report. As part of its commitment to the business of pet care, IBPSA holds its Fourth Annual Pet Care Services Educational Conference & Trade Show, October 18-20, 2016, in Las Vegas. Speakers and sessions are dedicated to helping pet care services grow their business, plan for the future, and maintain personal balance. The association is also presenting two pre-conference workshops, Pricing For Profit and Pet First Aid & CPR. For more information on the annual survey report and upcoming conference, visit www.ibpsa.com. The International Boarding and Pet Services Association (IBPSA) was established to foster and support the pet care services industry. The association provides training, education, products, trends, information, and legislative support to help its members succeed. As the leading professional trade association in the multi-billion dollar pet cares services industry, IBPSA currently represents hundreds of members across the United States, Canada, and beyond For more information, visit www.ibpsa.com.